Psoriasis is a common, chronic T cell mediated skin disorder that affects between 2-3% of the population. T cells are white blood cells that regulate the body's immune system. In psoriasis, T cells become over activated, which triggers an inflammatory response that leads to the accelerated production of skin cells. Normally, the time between the production and shedding of skin cells is about 28 days, however, in psoriasis, the process accelerates to approximately 7 times faster, and results in poorly formed outer cells that do not shed properly. Instead, the accumulated dead skin cells pile up and produce the associated scaling. Although the exact cause is unkown, current evidence suggests that autoimmunity, along with genetic influences, are contributing factors. Individuals with moderate-to-severe psoriasis may be significantly impacted not only by symptoms of the skin disorder, but also in terms of the affect on their quality of life. Frequently, joint involvement develops years later, and this associated disabling condition is known as psoriatic arthritis. Medical intervention under supervision of our skin care experts is recommended for the management of psoriasis to slow or prevent disease progression and improve the quality of life of affected individuals. Psoriasis can affect men and women in any age group. There is a genetic component to the psoriasis, but influence of inheritance is variable. Approximately 30% of people with this condition also have a first degree relative (that is parents, brothers, sisters and children) with psoriasis. 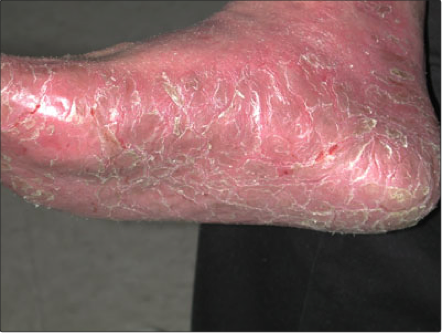 The severity of psoriasis may vary amongst family members. For example, onemember might have a very mild disease with only a couple of lesions, while another member may have more extensive involvement. A second type typically begins around age 60 and does not run in families. There are multiple treatments options to manage your Psoriasis. We offer topical and oral medications, biologics, physician dispensed natural products as well as advance laser technology and Phototherapy. Your provider will work with you to determine the best the best combination of treatments that best suites you.